Speculative Faith Reviews: Foundation: Salvation In Lies and Manipulation? Foundation: Salvation In Lies and Manipulation? If mankind’s only hope is a group of elites who lead us to the promised land, then please let me off the train. In Isaac Asimov’s Foundation, Hari Seldon has seen the future, and it’s ugly. The galaxy-spanning Empire will fall apart in the near future, and what will follow will be a thousand generations of chaos. But Hari Seldon also has a plan, one that will keep the chaos to a mere 1,000 years, if it all goes right. He’s gathers a large group of scientists, and has them set up to live on a middle-of-nowhere planet called Terminus, where they will create the most extensive and comprehensive encyclopedia in human history. But there’s more going on then any of them know, because Hari Seldon has not told them everything. This book is actually a collection of 5 short stories or novellas, and the events in each of the stories happen many years after the previous story. The first is about Seldon and how the plan for The Foundation gets set in motion. The second and third share a common protagonist, Salvor Hardin, though they take place about 30 years apart. The fourth and fifth are about traders and merchants. Maybe the short story aspect of this book explains why the characters come off as very shallow, though I’ve read short stories before that had decent character development in them. Maybe it’s just simply that, when it came right down to it, I did not like any of the characters, especially the good guys. There are essentially two types of characters in these stories, the hyper-competent good guys and the hyper-incompetent bad guys. The first type is able to find some kind of clever and unusual way out of any problem and crisis. The second type may not necessarily be villainous but they are portrayed as short-sighted, greedy, and violent. Little is made of the normal folk, expect that they are little more then sheeple. But the thing I mostly noticed was that there was no great difference between the good guys and bad guys. The good guys of The Foundation are just as determined to conquer and control and maintain their own power as the bad guys are. The Foundation may use different methods, but I’m not prepared to say that different methods mean they are any better. One thing I really noticed in these five stories was that women may as well have been almost non-existent. The only woman that made any like a serious contribution to the story was in the fifth story, and about all she does is get into a couple of nasty verbal exchanges with her husband, the ruler of a planet called Corell. That may change in Asimov’s later stories. I suppose it’s well-known that Asimov was an atheist. There is a place in The Foundation for religion, but it is a very cynical place. And conquest it is. In the third story, when the Kingdom of Anacreon wants to attack Terminus, Hardin uses this priesthood and the beliefs they have instilled in the people as a weapon of his own. Hardin has no belief in a Galactic Spirit and the Foundation leaders of the religion do not believe any of the religious aspects of what they teach. but they are quite happy to make use of it, as well as the gullible nature of the people, for their own ends. So let’s understand what they are and are not doing. When other planets and kingdoms send people to Terminus to learn about nuclear power, that knowledge is dressed up in the trappings of a fake religion that The Foundation made for it, or as Hardin put it at one point, “I started that way at first because the barbarians looked upon our science as a sort of magical sorcery, and it was easiest to get them to accept it on that basis” (page 92). In fact, in that same story a few chapter’s later, a priest who seems to be a true believer sums up the religious views in this way: “In the name of the Galactic Spirit and of his prophet, Hari Seldon, and of his interpreters, the holy men of the Foundation …” (pages 130-131). But religion is merely a weapon, and when that weapon ceases to give the desired results, then it is discarded, as it begins to be in the last story, when the Kingdom of Corell wants nothing to do with missionaries and the religion of the Foundation. The protagonist in that story, the trader Hober Mallow, says this the ruler of Korell, “…I’m a Master Trader. Money is my religion. All this mysticism and hocus-pocus of the missionaries annoy me, and I’m glad you refuse to countenance it. It makes you more my type of man” (page 190). To my mind, “conquest by missionary” is as much an act of violence as conquest by invading army. It is much the same thing as saying that being robbed by identity theft is just as much an act of theft as being robbed at gunpoint. Interestingly, someone like Hardin may not want to use violence in the most literal sense, he’s quite happy to make use of the threat of violence in the events that concluded the third story. The other saying is one attributed to Hardin, “Never let your sense of morals prevent you from doing what is right!” (p. 143). That might be the most pithy summation of relativism that I’ve come across. As if one can determine right and wrong without morality, or that what is right might possibly be immoral. Maybe the Foundation stories get better in later books, but taking simply this first book in the series by itself, I’m rather disappointed. It’s filled with shallow and undeveloped characters and buffoonish bad guys being outsmarted by clever good guys. Over it all is the almost god-like presence of Hari Seldon, the man who seems to have predicted almost everything, and the messianic idea of The Seldon Plan, which has to be kept going no matter what though no one really understands it or how to go about keeping it going. And if lies and manipulations are needed to keep the plan on track, so be it. If mankind’s only hope is some kind of group of elites leading it to the promised land, then I’d like to get off the train, please, because that version of the promised land will only be another disaster. Asimov may have discarded God, but what he uses to replaces Him is hardly anything I want to be a part of. Eh, I wouldn’t write off all the old stuff as bad. True, some of it is more noteworthy for the influence it had on later writers than anything else, but there’s some vintage SF that I would call good or even great, like C.S. Lewis’s “Space Trilogy” or Jules Verne’s “From the Earth to the Moon” (but not so much the sequel that Verne wrote later on). Good point. When I was growing up, I read some of Asimov’s “Lucky Starr” books, and other sci-fi series like Tom Swift and Tom Corbett. Those were stories I usually enjoyed. I read the first Foundation some time ago, and I wasn’t crazy about it. I finished it- which is more than i can say for Heinlein’s “Stranger In A Strange Land” (BORING! )- but it definitely was not engaging. As the article says, the characters we cold and unlikeable. 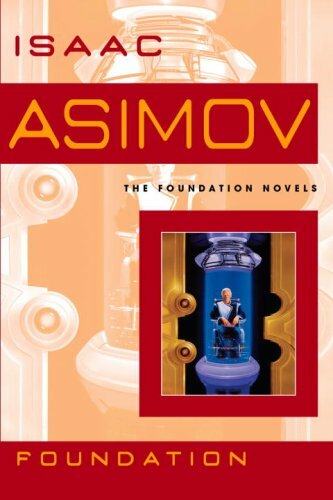 I’ve read The Foundation Cycle, and I used to own an “omnibus” of it. When I discard a book (via second hand stores), that usually means that there was something in it that I didn’t like. It’s been almost twenty years since I read it, but everything you’ve written here rings true with what I remember. I think it’s important to read, once, to get the sense of science fiction classics. I like his books on robots a bit better, and his book on the historical background of Shakespeare plays. I’m kind of amazed by how many books Asimov wrote, and although I’m not a fan of his beliefs, I can say that I appreciate how much work he put into his writing over the course of his lifetime – and not just in the science fiction field. Although Bradbury’s beliefs weren’t Christian either, he occasionally nodded at his Christian childhood in his books like Farenheit 451. As far as classic sci-fi authors go, I think his work is slightly more palatable for Christian sci-fi readers, although, again, the women characters are either missing or crazy, which gets pretty offensive if you’ve read several of those books in a row. Great post. You nailed it. And some people howl at us for putting “theology” into our stories, and chide us for letting our “beliefs” color our work. What you’ve reviewed so well may as well be the poster child for how an author’s belief system, mindset, worldview can permeate and ultimately dominate what he or she writes. Of course when “they” do it, it’s okay, because the world speaks to and of its own. When WE do it, now we’re “preachy.” Thank you for an excellent analysis and lessons well worth remembering. There is something to what you’ve said. For example, how many books get “preachier” then Ayn Rand’s “Atlas Shrugged”? Our works will be about our beliefs, and they will express those beliefs. I think the author makes some valid points, especially if you take Foundation as a standalone novel. What I’ve observed about the Foundation cycle is how each subsequent novel subverts the assumptions of previous ones. A lot of the Hari-Seldon-as-godlike idea, for example, is shattered in Foundation and Empire, and the ideas in Foundation and Empire are turned upside-down in Second Foundation. The fourth and fifth books, which he wrote some time later, pretty much upend everything in the original trilogy, first by challenging the “what” and later the “why.” I think his overarching plots are interesting, and I think his character development does get better over time as he lingers more on specific people; Book 2 has one of the more interesting — and frightening — antagonists I’ve ever come across in science fiction. In short, I think the Foundation series works best when viewed as a contiguous series rather than as discrete novels. Because of the serialized nature of the first three books, I think that’s what Asimov intended. As an aside, I recently read an Asimov essay (in the collection “Gold”) in which he lamented the lack of dealing with God in science fiction. He admitted that he was not a spiritual man, but did seem to wish more people were. Maybe I’m missing some important exceptions, but for the most part I did not find Asimov to be overly hostile to faith in the novels I’ve read, although I don’t recall him engaging faith much, either. I’ve only read his robot books (which I loved). It always seemed to me that he played with the idea of God and religion. Just because he didn’t believe in an afterlife didn’t mean he didn’t hope there was one. See the peculiar ending of Positronic Man. I think the sheeple-ness and the “I have to make all the decisions for everyone else for their own good” thing is a feature of the white-man-itis that plagued midcentury sci-fi. Classism as well as sexism!